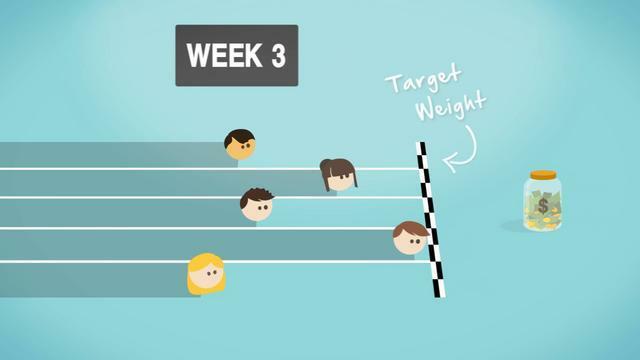 Operating since summer 2012, DietBet is a service that allows anyone to bet real money on their ability to lose four percent of their body weight within four weeks. Designed to encourage physical activity and proper dieting, a DietBet user joins a game through the site or mobile application and contributes the required bet into the pot. As more people join the game, the pot continues to grow and the potential to double or triple the initial investment increases. At the moment, there’s a ongoing game with nearly $150,000 in the pot and about 6,000 players. Within the 48 hour window prior to the scheduled start of the game, all users that have placed a bet have to upload two photos to DietBet. The first photo is a full-body shot of the user standing on the scale and the second photo is the scale’s weight readout with the weigh-in security word placed by the scale for verification. If a user doesn’t have someone to take a photo of them standing on the scale, they can use a full length body mirror instead. All photos and weight data are kept completely confidential from other users. 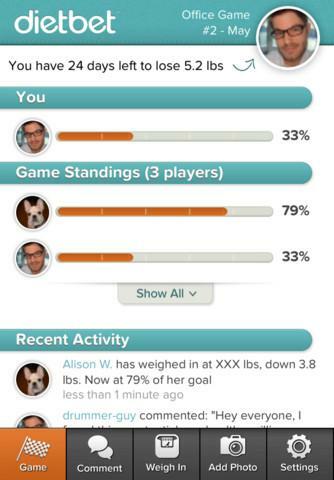 Photos are also submitted at the end of the game to verify the weight loss. The photos are reviewed by referees at DietBet in addition to computer algorithms looking for potential cheaters. If the DietBet referees suspect foul play, they can request a Skype video chat, a video recording of the weigh-in or an in-person weigh in at a location like CVS or Walgreens. If the user doesn’t agree to the audit of their activity, the bet is forfeit to the rest of the users in the game. In addition, rapid weight loss will disqualify someone from winning the pot. Anyone that loses more than 12 percent of their weight over the 28 days will be disqualified. Within the game’s page, users can post comments about their progress, quick updates about their current activity, photos of their progress and weight data. Users can also post updates directly to their Facebook and Twitter accounts for an additional source of motivation. According to DietBet, users that post to those social networks lose 20 percent more weight due to the public nature of their fitness goals. On the business side, DietBet makes money off each game by charging a percentage based of the size of the initial bet. At a bet level between $1 to $99 per user, DietBet’s take is 20 percent of the entire pot. When the current $150,000 game closes, DietBet will take $30,000 of that as a fee. The remaining $120,000 will be split among the winners. According to a recent interview with Mashable, the average percentage of users that hit the four percent weight goal is usually between 33 to 40 percent. Assuming that range holds for the $150,000 game, winners that made an initial $25 investment stand to get a return of $50 to $60. Later this year, the team at DietBet plans to launch a new type of platform that will stretch over six months and encourage a total weight loss goal of ten percent. The focus of this platform will be keeping the weight off and staying healthy, not just hitting a short term weight loss goal.